People take part in a wine battle, in the small village of Haro, northern Spain, Friday, June 29, 2018. 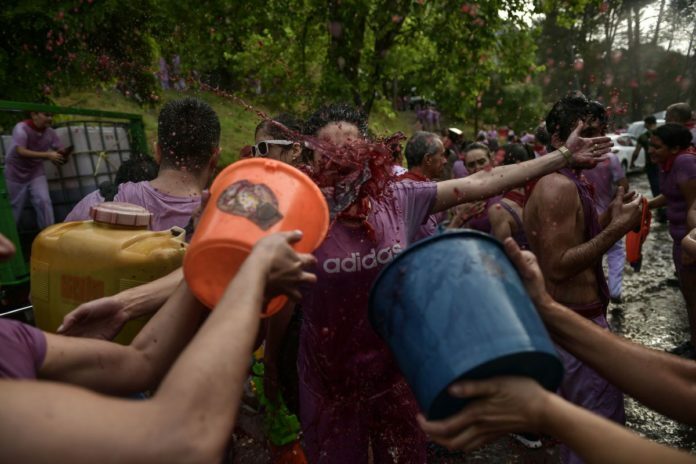 Hundreds of revelers participate in this famous summer battle throwing thousands of liters of red wine over each other. Imagine sitting at your desk at work, eyelids heavy, the 2 o’clock hour approaching. Your mind wanders. Another coffee? Energy drink? Lament that there are still at least three hours left in the work day? Wouldn’t a mid-afternoon nap solve everything? Yes, it would. It’d give you just the energy boost you need, revitalize your attitude, and just might make you care a little bit more about the work you’re doing. But forget about all that now. After all, this is America, home of the 9-to-5 work day. If you were in Spain, those heavy eyelids could go ahead and shut close for an hour after 2 p.m. You could meet a friend at a café, eat something, maybe have a cold beer or just rest. Then you could go back to work to finish the rest of the day. Your day might end a little later, but you definitely wouldn’t feel as tired. The siesta has been a Spanish tradition for centuries. More than just a nap, it is a birthright, an obligation, a staple of Spanish culture and outlook on life. There is an ease to life in Spain. Drink flows constantly, tables are filled with food, smiles and dancing are present into the waking morning hours. If you need more proof that the Spanish know how to live, try their wine. Out of all the options in the old world, there is a special place in my heart for Spanish wine. For personal reasons mostly, I lived in Madrid for a good length of time, that’s where I truly began my love affair with wine, and to their credit, the Spanish are very good at making wine. Wineries there date back centuries, a significant percentage of their vines began producing grapes well before the revolution in 1936. When people do think of Spanish wine, they often think of La Rioja or Ribera del Duero. And this is for good reason. Incredible wine comes out of these two regions, and they produce more wine than any other region in Spain. Spanish tempranillo reigns supreme out of all other varietals, arguably the most important grape in the country. Flavors of cherry are ever present in tempranillo, but there is a range to these flavors. Under ripe cherry, dried cherry, bright cherry, dark cherry, tart cherry, sweet cherry, to name a few. The other constant in tempranillo is oak. By law, tempranillo must spend some time in oak barrels which will impart notes of smoke, char, vanilla, toast and baking spices. I own more bottles of Spanish reds than I do anything else. Rioja is reliable, Ribera is indulgent. If you ever have the opportunity, get your hands on a bottle of anything made by Vega-Sicilia. Not only the most popular winery in Ribera del Duero, it is revered all over the world. Something else overlooked when discussing Spanish wine is their white wine. Quite plainly, no other country produces such quality, affordable white wine that’s lively and energetic, poetic and flavorful. You should have no problem finding a bottle for under $20 of garnacha blanca (Grenache blanc). Their sauvignon blanc and verdejo is also outstanding. In the spirit of expanding our horizons, I encourage you to also try wines from lesser known regions. Castilla-La Mancha, Toro, Priorat and Jumilla are excellent places to start. One thing that can absolutely not be left out is the region of Jerez, the home of Sherry. Sherry has a fascinating history, a reflection of the rich and diverse culture that has existed in the south of Spain for centuries. Sherry is a fortified wine, much like port, and it can be enjoyed after dinner. There is a myriad of choices when it comes to sherry as well. Drier sherry expresses itself in palomino and manzanilla. You can also find a sweet version in cream sherry, and Pedro Ximenez, affectionately referred to as PX. I once knew a Spanish woman who would pour PX over her waffles in the morning. She was then, and continues to be, my hero. Wine is, at its’ core, an expression of the place it came from. Specifically, we’re talking about the land of Cervantes, de Unamuno, García Lorca, Goudi, Dalí and Picasso. We’re talking about the culture that invented tapas, where every restaurant you walk into has a dried pig leg on a spit waiting to be carved whether you’re in Madrid or Sevilla. This is the place where the poetry of Antonio Machado whispers itself to you in the breeze, where everyone is always happy to see you and 2 o’clock isn’t the worst time of the day. Why should you drink Spanish wine? Because it’s delicious, yes. But also because it’s a representation of a much simpler lifestyle, one that’s full and beautiful. Carlos Cardenas provides monthly wine recommendations to The Monitor. Cardenas is an introductory Sommelier.